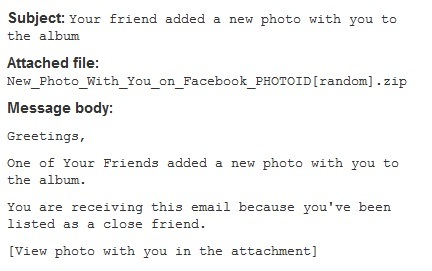 Cybercriminals have been sending new strain of malware via emails to Facebook users, encouraging them to view photos as an attachment. So for all Facebook users who totally rely on email alerts service to know when and what their friends do, are on risk of getting their computers infected with malware. 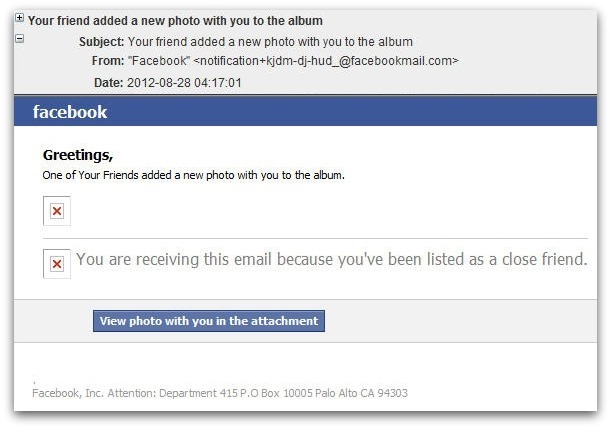 Scammers are sending out e-mails saying that someone has added a new photo of you to a Facebook album. The spam, which claims to come from the social networking giant, includes an attachment that installs malware on your computer. If you click on that attachment, It will downloads a ZIP file and if you open that ZIP file and click on files which are in that zip file, then that malware will get installed in you computer and it will enables hackers to gain control over Windows-operated PCs. 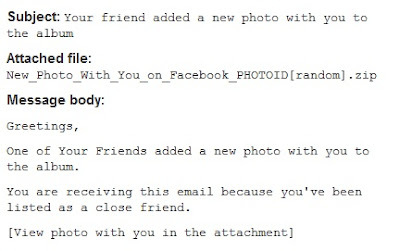 The e-mail subject is typically something along the lines of “Your friend added a new photo with you to the album” (though cybercriminals can easily alter it) and appears to come from an e-mail like “notification+kjdm-dj-hud_@facebookmail.com” (again, this can be changed). 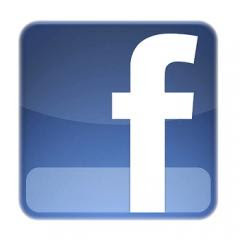 The attached file is named “New_Photo_With_You_on_Facebook_PHOTOID[random].zip” where “random” is a generated number. Of course, above emails don't really come from Facebook team. Such emails are fake emails designed to trick or fool recipients into opening the attached file which contains a photo / image. But the attachment is not a image, its a malware which can hack you computer and allow hackers to gain control over your Windows computer. This malware was identified by security firm Sohpos as Troj/Agent-XNN. But there are surely so many peoples in the world who could be duped into believing that they have been tagged by one of their friends in a photograph, and want to see if they look overweight, unattractive or simply fabulous. 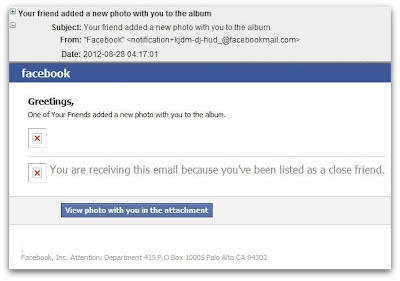 So Facebook users should be aware by now that the social media site like facebook twitter never sends the pictures or files posted online as attachments via email. That’s why users are always advised to beware of such notifications.